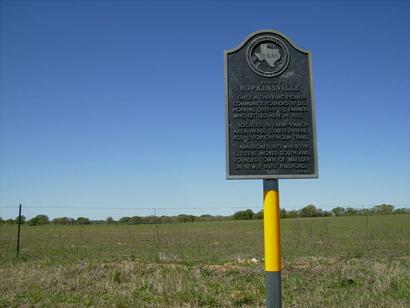 Hopkinsville, Texas, Gonzales County ghost town. Established in 1852, the community was named to honor Dennis S. Hopkins, town founder. A post office opened the following year. Essential businesses opened as well as churches and school. Thomas Zumwalt deeded land to be used for a union church, Masonic lodge and school. 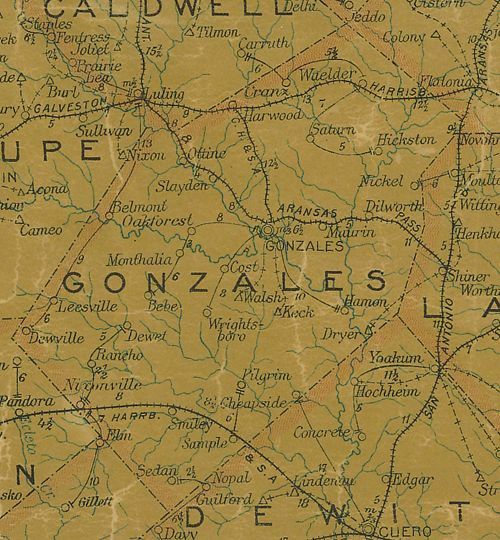 The town was bypassed by the railroad (the Galveston, Harrisburg and San Antonio Railroad) and Waelder was established in 1874. Hopkinsville businesses made the move to Waelder and the post office shut its doors in 1876. By 1900 Hopkinsville was on its way to becoming a ghost town � with cabins deserted and the more substantial homes moved to Waelder. By the second half of the 20th Century Hopkinsville was nothing but a cemetery and a few foundations. Today all that�s left is the marker shown here. Once a thriving pioneer community founded by D.S. 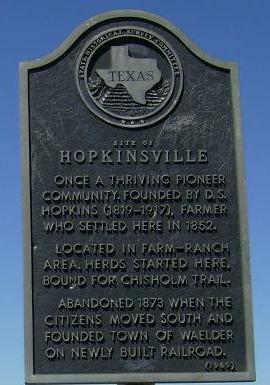 Hopkins (1819-1917), farmer who settled here in 1852. Located in farm-ranch area. Herds started here, bound for Chisholm Trail. Abandoned 1873 when the citizens moved south and founded town of Waelder on newly build railroad.